OCEAN RIDER TROPICAL FARM RAISED SEAHORSES BORN AND RAISED IN THE USA!! Please check that your basic water quality parameters are within acceptable range which are: Temperature range: 68F –82F, optimum temperature75- 78F, Ammonia 0, Nitrites 0, Nitrates 1-10ppm, PH 8.2 – 8.4, Specific gravity 1.022-1.025. All Ocean Rider seahorses are pre trained to feed on frozen mysis shrimp from Piscine Energetics enhanced with Vibrance. Our recommended feeding regime is: 2-5 frozen mysis shrimp enhanced with Vibrance per seahorse per feeding twice a day, 6 days per week. We recommend fasting your Ocean Riders one day per week. Don’t worry about feeding the seahorses immediately upon arrival . Give them 24 hours to adjust to their new home before introducing the thawed frozen mysis. These seahorses are very well fed before leaving the farm and can easily go a day or two without food. Be Careful NOT TO OVERFEED. If There are leftovers on the bottom of the tank for more than 30minutes you are overfeeding and will need to siphon out the uneaten food and reduce the amount of mysis for the next feeding. Do NOT feed OR’s a variety of different feeds as this will only make them confused and sick. There is no need to use a turkey baster unless it is a personal choice as all OR’s are trained to take the mysis off the bottom. Please do NOT feed seahorses before going to sleep at night. Sprinkle a “pinch” of Vibrance onto the frozen mysis. Allow the mysis shrimp to thaw. Gently mix the Vibrance into the mysis so that the head is red. Apply the feed to seahorse tank. You will see that they recognize this food quickly and will even take the mysis off the tank bottom. This high quality frozen mysis shrimp, combined with Vibrance creates a food that is very high in HUFA’s (especially DHA omega 3 and omega 6 DHA series),carotenoids, vitamins and minerals which are essential components to the diet of the seahorse. This is such a good diet that we recommended that you “fast” your seahorses one day per week. Feeding of live food is for your entertainment and as a treat for the seahorses. Ocean Rider does not recommend feeding live foods more than once per month. If you do choose to feed live please use our iron horse feeds or live brine shrimp enriched with Vibrance. Feeding live feeds of unknown origin may introduce pathogens into your system. Ocean Rider Seahorses will live for 5 to 10 years, so if you want to keep them this long follow our recommendations above and remember your new pets like plenty of bright thick hitching posts, are vertically oriented animals, and do better in groups, so feel free to put several seahorses together in the same tank. Although our seahorses do pair pond, they can be very gregarious and will court and mate with others, which means you will have the opportunity to witness their magnificent mating dance frequently! For more information visit the hobby and getting ready page and join the exclusive OCEAN RIDER CLUB where seahorse talk is the walk!!!!!! 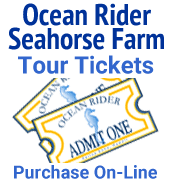 We hope our farm raised Ocean Rider seahorses bring you hours of enjoyment every day for years to come! !